Altman LED Chalice 50W fixtures along side Altman 250W LED Phoenix profiles at Arizona Western College. 5 Words Media was contacted by Sound Image of Arizona to help design and build a state of the art lighting system for the historic theatre at Arizona Western College in Yuma, AZ. The existing system relied heavily on incandescent lighting with a distributed dimming system. Because of the limited electrical service to the theatre and the extreme power usage of the existing lighting systems, the AV systems were limited in their performance and ability to service the 400 seat venue. 5 Words Media proposed a flexible and efficient LED lighting/Incandescent dimming hybrid system. Utilizing Electronic Theatre Controls “Thru-Power” technology, 5 Words Media reduced the existing power footprint by 80% allowing the audio & video system to be expanded and meet the needs of the space. This reduction of electricity was accomplished by utilizing exclusively LED architectural and stage fixtures from Altman Lighting. After providing an extensive DMX network throughout the space, 5WM utilized 18 Altman Chalice 50w downlights in both pendant and recessed configurations to replace existing incandescent house units. The stage lighting was accomplished via 36 Altman Phoenix LED Profiles, 12 Altman Spectra Star Pars, 6 Altman LED Work Lights & 8 Altman Spectra Cyc 100’s. Legacy conventional fixtures were serviced, cleaned and placed into inventory to supplement the core LED system as necessary. The control system is comprised of a DMX distribution network from Pathway Connectivity, Doug Fleenor architectural entry stations, and an ETC ION 1000 console controlling all fixtures through 16 bit control. The new ION console interfaces with all fixtures via RDM to dynamically allow control & configuration of all units from the lighting booth. A wireless router system has been installed allowing remote programming and focus of the lighting system from anywhere in the facility. 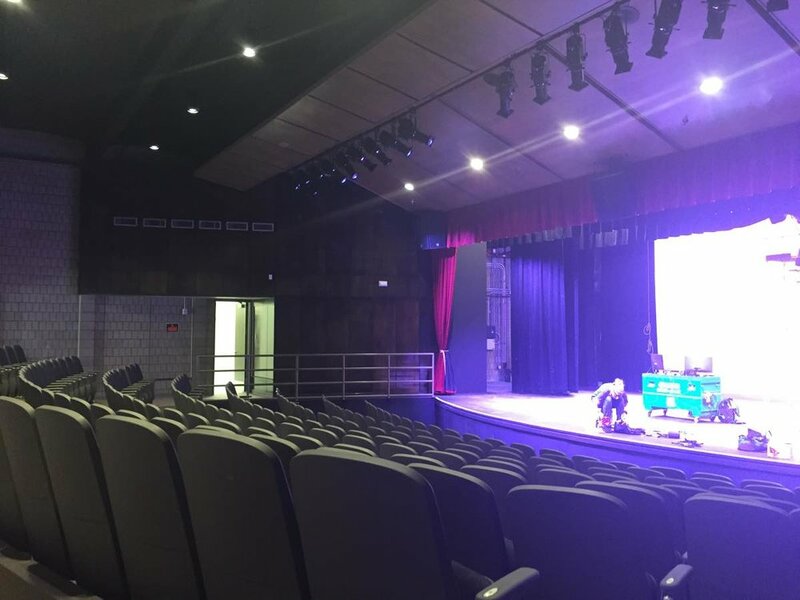 New soft goods and rigging positions were created to accommodate the growing needs of this educational theater space ensuring a safe working environment for years to come. All systems were installed on time and under the clients budget in time for the fall 2015 semester.